IMPORTANT STORIES ABOUT OUR MULTICULTURAL SOCIETY AND HOW THEY RELATE TO SCOTTSBORO, ALABAMA. INCLUDING STORIES ABOUT THE SCOTTSBORO BOYS AND THE CASE THAT CHANGED AMERICAN JURISPRUDENCE. The "Scottsboro Stories" blog reflects the writings, photographs, arrangements, opinions and musings of me, Garry L. Morgan, only. I do not represent the Scottsboro Boys Museum or the Scottsboro Multicultural Foundation - the parent organization of the Scottsboro Boys Museum. I receive no profit from this endeavor. This blog is for educational purposes and that of open expression about racial and sexual discrimination, institutional and personal racism and the deadliest war of all time - "The Culture War." Do you know what Juneteenth is? It is the name for a holiday celebrating June 19, 1865, the day when Union soldiers arrived in Texas and spread the word that President Lincoln had delivered his Emancipation Procalamation. News traveled so slowly in those days that Texas did not hear of Lincoln's Proclamation, which he gave on January 1, 1863, until more than two years after it was issued! The proclamation declared "that all persons held as slaves" within the rebellious states "are, and henceforward shall be free." Thus, the Emancipation Proclamation was limited in many ways. It applied only to states that had seceded from the Union, leaving slavery untouched in the loyal border states. It also expressly exempted parts of the Confederacy that had already come under Northern control. Most important, the freedom it promised depended upon Union military victory. Although Juneteenth has been informally celebrated each year since 1865, it wasn't until June 3, 1979, that Texas became the first state to proclaim Emancipation Day (Juneteenth) an official state holiday. But it is much more than a holiday. 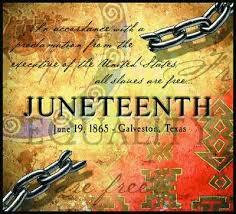 Juneteenth has become a day for African Americans to celebrate their freedom, culture, and achievements. It is a day for all Americans to celebrate African American history and rejoice in their freedom. Video Short featuring Ms. Sheila Washington, Director, Scottsboro Boys Museum. Click on image for detailed Scottsboro weather report. Garry L. Morgan All Rights Reserved for writings, photographs and art by Garry L. Morgan. The Scottsboro Boys Museum and Cultural Center is needed to educate our local community and the nation concerning the disease of racism and the debilitating effects of this disease which still exists in our society. The Scottsboro Boys Museum should be managed by the University of Alabama or Alabama A&M University as a project of the educational system of Alabama with input from race relations and minority studies scholars in Alabama, the nation and across the globe. Management by the Alabama University system is necessary to insure the sustainable and accountable operation of the museum and its role of race relations education in our state and nation. The cultural history of Jackson County and Scottsboro, Alabama is displayed at the "Heritage Center." The center has a wonderful geneological library which includes many slavery period documents establishing geneological backgrounds of early African-Americans in Jackson County Alabama. References relating to Native Americans, the Civil War, African Americans, Mountain Folk and European Cultures may be found at the Center. Sagetown is an excellent example of a reconstructed 19th century village displaying a school, blacksmith shop, mine, and pioneer living indicative of all cultures during the 19th and early 20th century period of our history.